The New York Times has a big feature out about the President personally approving every single unmanned drone attack, and boy is the BBC’s US President editor distraught. It’s been making the rounds of the media today, lots of debate, and Mardell is not taking it well. Is Obama’s drone doctrine counter-productive? It doesn’t make the President look bad in the mainstream media, but it sure angers the anti-war crowd. The report features several high-ranking Administration figures, and even Mardell realizes that they’re talking with His approval. It was clearly coordinated with the New York Times as an opening move in the official election campaign now that the Republican race is finally settled. I’m not sure this is going to go over very well on either side, and I don’t think it’s going to give Him any kind of boost in approval. What I think may be going is that this was all going to be revealed in a book due out soon, and the White House coordinated with gave some interviews to the New York Times to give His side of the story in an attempt to head that off at the pass. The President has to tread a very careful line on the war against Islamist military and terrorist action. On the one hand He needs to keep the anti-war crowd on side and withdraw the troops from Iraq and Afghanistan. On the other, He has to reassure the rest of the country that He’s still taking strong action to fight our enemies. So on one side He’s ending the official war business in Iraq and Afghanistan, drawing criticism from those who say it’s retreat and leaving a mess before our work is really done, but on the other side He gets to have Bin Laden’s head figuratively on the spike outside the Tower of London. These drone attacks are supposed to help Him walk that line, and it’s pretty obvious from the NY Times piece that’s the message He’s trying to send. He’s telling the people whom Mardell loathes as wanting justice “from the barrell of a gun” that He’s still keeping us safe. He’s also telling the anti-war crowd that He’s really on top of things, and doing this to avoid civilian casualties and not to worry because He has the moral authority to make these decisions. I guess when you win the Nobel Prize for Peace, you get to choose your targets. And it’s killing Mardell inside. So he spends most of his piece giving you different voices critical of the whole drone process, the usual journo trick for expressing views by proxy. Some say they’re murder, he writes. Some say they’re illegal, and other say the strategy doesn’t work. Then he frets that the President will find the “sci-fi” aspect too attractive anyway, which is him expressing his disapproval of the drone attacks. Not a single word from anyone holding the point of view that maybe killing Al-Alwaki or Zawahiri might have prevented more attacks on civilians or troops or anything of the sort. It’s all negative. Regardless of which side of the issue one is on, there can be no question that this isn’t a balanced or impartial take. It’s not difficult to guess which side of the issue Mardell is on. One can almost hear him sighing as he types the words. This warmongering continues to be the only one of the President’s policies about which Mardell is critical or has written anything negative. He eventually had to figure out a way to spin Gaddafi’s death as vindication for the President’s supposed strategy of “leading from behind” on Libya. He’s even criticized the fact that troops will still be in Afghanistan for a while longer, until security is finally handed over to the Afghans, showing that he doesn’t know the difference between that and a cease-fire. Amusingly, even though this reads like an angry letter from a spurned worshiper, Mardell still can’t quite bring himself to remind you the very relevant fact that the President has killed more people with these drone attacks than Bush could ever have dreamed of. That would just be too much negative about Him in one place, and we can’t have that. His piece isn’t journalism: it’s an op-ed disguised as a question. But I guess that’s what he’s really paid to do, isn’t it? Last year, a book about the President came out in which it was revealed that His White House was a hostile workplace for women. Even the lapdog US media had to talk about it, although they quickly moved on. The BBC censored all news of it, because it made the President look bad. Now another one is coming out, and the mainstream US media is all over it. Once again, the BBC is censoring the story, so you don’t get to learn anything which might make Him look bad. But will the nuance of his finely-tuned brain be lost amongst the bold print of the headlines? Of course, the BBC did find time to mention three different books about George Bush which came out during his time in office. One was about insider stuff from his Administration, one was an attempt to paint a portrait of the man from interviews with six people close to him, and one was by a psychiatrist who wondered if Bush was disabled. They even thought it was worth telling you about a biography of his wife. I’m not sure a regular biography of Bush was published while he was President. I can’t find one online anywhere. I wonder if that has to do with the fact that we knew all about him by the time he ran for office, while The Obamessiah’s background was shrouded in mystery or simply covered up, any negatives dismissed as racism or falsehoods. The Internet is buzzing after the Washingtonian published a review of Washington Post associate editor David Maraniss’s forthcoming book “Barack Obama: The Story,” including an excerpt about President Obama’s high school clique and their favorite pastime. Barry also had a knack for interceptions. When a joint was making the rounds, he often elbowed his way in, out of turn, shouted, “Intercepted!,” and took an extra hit. No one seemed to mind. The boy is the father of the man. Just do an internet search for “Choom” (mooch spelled backwards – so apt) and you’ll see just how much the BBC is out of step with the rest of the media on this one. It’s just another reason why their usual excuse for doing something because the rest of the media is doing it rings so hollow. The BBC found plenty of time to remind you of George Bush’s youthful indiscretions, including here, here, and here. After he was inaugurated in 2001, Gavin Hewitt thought it important enough to grill Bush’s former pastor about it for a Panorama special. Even the late Alistair Cooke mentioned it once. So why does the BBC censor such stories about the current President? The thing is, I don’t think this is going to hurt Him much at all. Perhaps it whittles away a little more at His shining image in the mainstream press, but anybody turned off by this revelation wasn’t going to vote for Him anyway, and anyone still dedicated to His cause certainly isn’t going to be dissuaded by this silliness. I doubt this will cost the President a single vote. But it makes Him look less than the supreme intellectual, smartest man in the room, superstar destined for greatness we’ve been hearing about from the BBC for the last four years. It’s also more evidence that the media failed in their jobs and refused to look too deep into His past in 2008, something else the BBC would hate to admit. Some people here may be aware of Cory Booker, mayor of Newark, New Jersey. He’s a rising young Democrat star, well-liked in his city, and has gotten quite a bit of press and praise for his use of social media to get people together and personal touch when actually helping voters. Even the BBC knows about Booker. They’ve reported, for example, about how he personally helped to save a neighbor from a burning house (including an end note about his shoveling snow for residents during an earlier winter storm). Booker also got a special mention in the op-ed piece they commissioned (or licensed for reprint, it doesn’t say so I can’t be sure) to praise the President’s “historic” endorsement of homosexual marriage rights. That wasn’t written by a Beeboid, but there’s no way the BBC can claim never to have heard of him before as a progressive rising star. You can read some background on Booker here. The reason I bring this up is that Mayor Booker has been all over the US news media in the last couple of days for criticizing the President’s attack on Romney’s professional history as a venture capitalist. There have been further developments, making it an even bigger deal than it was originally, but the BBC has so far decided to censor the story entirely. Why? Because it makes the President look bad, and makes Him look less like the same alleged superhero who supposedly ran the perfect Presidential campaign in 2008. 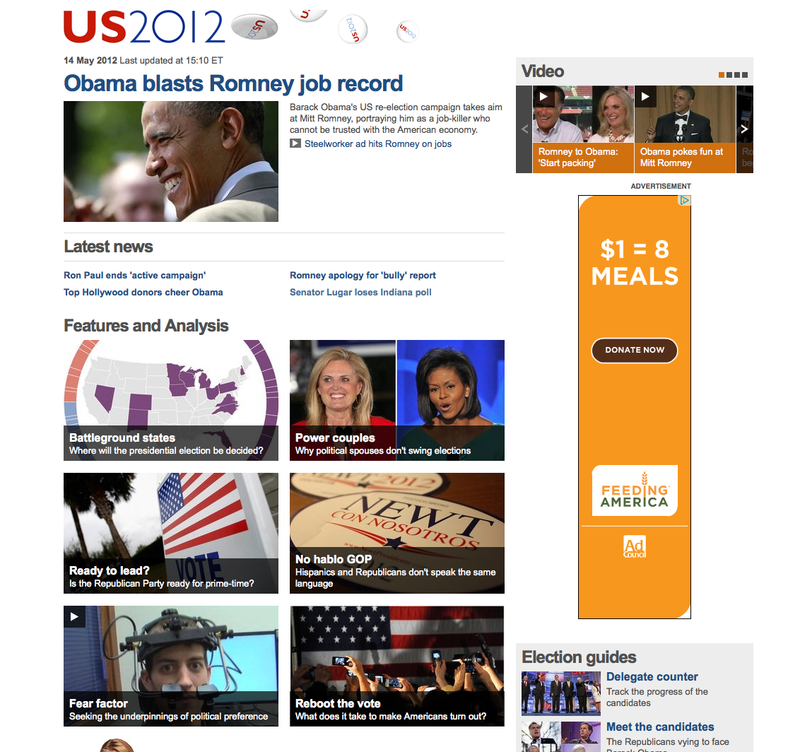 Last week, DB posted about the BBC’s one-sided reporting on the President’s attack ad on Romney. The ad was an attempt to mislead the public into thinking Romney earned money from personally destroying a business and putting hundreds of people out of work. The President’s campaign – or rather, a Super-PAC which supports Him – put out a second ad taking the same line of attack to another level. The US mainstream media, still being in the tank for Him, added fuel to the fire of attacking Romney for his business success. The ads backfired somewhat, because the US is not Europe or Britain, and class war and wealth hatred doesn’t sell quite so well with the voters. The President continued that attack theme in other speeches, and Cory Booker, mayor of what some see as a suburb of New York City, criticized Him for it on MSNBC’s “Meet the Press”. He called the attacks on venture capitalism “nauseating”. Needless to say, Booker was immediately vilified by most of the media, and the President’s own man, David Axelrod, publicly called him out on it. The President’s supporters at MSNBC also went on the attack, as did the usual suspects (next time someone complains to you about how biased Fox News is, show them that link). Booker apparently also got a lot of pressure from both the White House and the Democratic Party national bosses, and quickly had to re-emphasize his ultimate support for the President and His Party. This was all over Twitter, the HuffingtonPost, the Washington Post, and Politico. The New York Times called Booker a “surrogate” for the President. So we know the BBC staff in the US is well aware of the situation. Things got so bad for Booker, in fact, that he made a special video statement to “clarify” his point. Politico’s headline on this could almost qualify for a typical BBC job: “Booker walks back ‘nauseating’ comments”. But the story doesn’t end there. First, the President came under fire Himself because people started pointing out that He raised huge amounts of cash from venture capitalists. The most of any other candidate in 2008, in fact. Worse still, one of His current top bundlers not only worked for Bain, but actually did take over and shut down a company, sending workers to the unemployment line, and made a nice fat profit doing exactly what the President’s campaign tried to accuse Romney of doing by dubious association. If this had been done by a Republican, Mark Mardell or some other well-paid Beeboid in Washington would be lashing such hypocrisy with the usual sarcasm and sneering. As for Booker’s own video, the White House tried to use this as a campaign tool. But, being the inept group of amateurs who added silly boasts about the current President to the official biographies on the White House website of a number of past Presidents (in the 20th Century, from Coolidge onward), the recent attack on Romney and that dog story, which backfired spectacularly, and all those failed hashtags, the campaign geniuses couldn’t leave well enough alone. So they heavily doctored Booker’s video to slant his words differently (something the BBC is also wont to do), and started promoting it. Ridicule ensued, and even someone at the Washington Post not named Jennifer Rubin admitted something was wrong. Leading Democrats have suggested the White House abandon this strategy and move on. Basically, this has been a big story, a possible early turning point in the election year, the kind of thing the BBC’s US President editor usually rushes to explain to you. But it’s really just another disaster that makes Him look bad, and the BBC censored it, as usual. Sometimes Mark Mardell just can’t help but express his opinion on world affairs. This time he’s expressing his disdain for the way US troops will continue to engage in military action in Afghanistan even though a decision has been made by the President to hand full military control over to the Afghan Government in 2014. The fact that he simply doesn’t understand what this means shows just how naive and ideological the man is. After the obligatory dig at George Bush, Mardell gives us an analogy to show us what he thinks about the whole state of affairs. He likens the troop draw-down and continued military policing of the country to the pointless butchery in the last few hours of World War I after the armistice had been signed. No, this highly-paid, world-traveled, expert journalist actually doesn’t know the difference between a cease-fire and the gradual handing over of power to a new government after military reconstruction. I have been asking some of those involved whether the end in Afghanistan amounts to a prolonged version of much the same thing. For the next two years British and American soldiers will be risking their lives for a war that we know will end in 2014, no matter what. See what I mean? He really doesn’t get it. And he’s not done expressing his opinion. Of course, being a clever, trained journalist, he uses the rhetorical device of asking a question behind which to hide his opinion. Has Nato masterfully spun an acceptance of defeat and subsequent retreat into something that looks a bit like victory? Defeat? Al Qaeda has long been broken into the tiniest of pieces, really no longer existing, the Taliban we’re fighting bears little resemblance to those who ran much of the country 12 years ago. This is obviously a definition of “defeat” I wasn’t previously aware of. It’s not a perfect, obvious victory in that we haven’t created a stable environment like we did in Germany or Japan after WWII. But Mardell doesn’t see any of that. He sees only continued fighting, ergo it’s a defeat. So outraged and confused is he by the fact that young men will continue to die for what he sees as someone merely hitting the “off” switch, that he goes to Ft. Bragg to question the last batch of US troops preparing for their tour of engagement. Fortunately, most of the soldiers seem to understand what they’re up against, and can grasp the larger picture better than the man the BBC expects not only you to trust about US issues, but expects their own young journalists to trust for lessons on how to be a correspondent. It seems obvious to me that Obama has been pretty hard-headed, deciding to end a war when it was clear to him that it couldn’t be “won” in a conventional sense. This view is supported by an important article by David Sanger in the New York Times. Here we see the appeal to authority. Because he realizes most of his readers won’t know who Sanger is, he even explains that authority for us. Sanger’s record is impressive. He gets the inside story more often than any other Washington journalist. People who do know who Sanger is, though, will know that he mostly just likes hands-on, authoritative Presidential behavior in this matters. He like Clinton’s quasi-personal approach, mocked Bush as “Incurious George”, and expressed his disappointment when the current President dithered on Libya and then led from behind. Funny how Mardell wasn’t appealing to Sanger’s authority then, eh? So now when the President has acted decisively, Sanger is pleased. Mardell is especially pleased because on this occasion his beloved Obamessiah has done something with which he agrees. The many anti-war protesters who gathered on the streets of Chicago believe the real problem is the exact opposite. Among them is Occupy Washington’s Kevin Zeese. He says soldiers are going on fighting their way towards a deadline for one reason. “That’s what happens when you lose a war. It is like Iraq. This is how you get out when you lose. Mark Mardell: BBC anti-war correspondent, and dishonest Beeboid. Why am I calling him dishonest this time? Because Kevin Zeese isn’t just an Occupier or merely one of a number of anti-war protesters: he’s also executive director of the anti-war activist group, “Come Home America“, and co-founder of “Voters for Peace”. The man the BBC expects you to trust most on US issues doesn’t want you to know that, because it would detract from the credibility of his piece, so he left that out. Neither he nor his editor want you to know the truth, because it’s with Zeese that Mardell agrees most of all. White House propaganda, White House propaganda, and more of it, with a couple of fluff pieces thrown in. 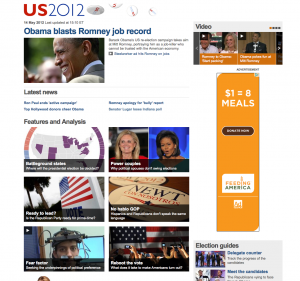 The top story at the moment is the BBC’s explanation of the President’s first ad attacking Romney for his association with Bain Capital. It’s become more balanced than it initially was, as people here pointed out earlier this week, and presumably after somebody at the BBC realized it. It’s still not entirely balanced as they’ve got the President’s ad embedded right at the top of the piece, while including only a link to Romney’s rebuttal. The link below that is to a second attack ad on Romney on the same topic. No links to anything from Romney. The “Latest news” section is slightly out of date, but the bias is still obvious. Besides the news brief about Ron Paul ending his “active campaign”, the other featured reports are about Hollywood feting the President for His recent endorsement of homosexual marriage, a piece about Romney reacting contritely to that Washington Post hit piece – now proven to be less than accurate, although the BBC has never bothered to inform you of that – about him allegedly bullying a homosexual a few decades ago (another score for the White House campaign machine), and a piece lamenting Sen. Richard Lugar’s defeat in the Republican primary for Senate in Indiana. We’re told by “correspondents” that this will make the Senate more partisan than ever. Translation: the Democrat majority won’t get their way so easily. This is a biased position, of course, shown to be all the more ludicrous since the Senate just rejected the President’s own budget proposal 99-0. You can’t get more bi-partisan than that, which is why the BBC has so far censored that news. Barack Obama will be hoping to hold on to the sizeable majority he won in 2008, and will be helped by the state’s strong union movement. The unions have been leading the opposition to new Republican Governor Scott Walker’s controversial bid to restrict workers’ collective bargaining rights. The proposals led to mass protests and a successful attempt to trigger a recall election for Mr Walker’s job. The bit I’ve bolded is, quite simply, a lie. What Walker did was restrict the right of public sector unions’ rights on collective bargaining. The BBC admitted that part when they first began reporting on this story, yet here they deliberately mislead you to think it’s an attack on all workers, full stop. I simply don’t accept the excuse that this was simplified due to space constraints or because it’s an unimportant distinction. And of course, by “controversial”, the BBC means that the unions didn’t like it. Another issue of bias here is that the BBC gives you only the Democrat unions issue, and not the budget disaster Gov. Walker faced upon taking office, which just as much a concern for voters. The budget concern is why Walker sought to restrict public sector union power and their burden on the State. It’s not all union workers everywhere, only the public sector ones, which is why I maintain that it’s an important distinction. As most people here will know, their coverage of the Wisconsin situation has been extremely biased and at times dishonest. Plenty of background can be found here, here, here, here, and here. I don’t expect the BBC to update this section with the news that the union-backed candidate lost the Democrat primary for the recall, which kind of puts a damper on the whole issue, making the BBC’s take even less useful. The magazine piece explaining why candidates’ wives don’t win elections is reasonable, no bias there, for a change. Next up is the piece by Justin Webb – Mark Mardell’s predecessor as North America editor, whose gushing reports about The Obamessiah during the 2008 election won him the coveted seat on Today – explaining why the Republicans aren’t ready to lead. My fisking of ol’ Justin’s piece is here. Then you get Jonny Dymond’s biased piece telling you how the Republican Party is just for white men, freezing out Hispanics. It’s just one in a series of race-baiting pieces from Dymond, whose remit seems to be proving that Republicans and any opponents of the President are racist. See here, for example. If you still aren’t convinced that Republicans/conservatives are awful, then you can move on to former Obamessiah activist Matt Danzico’s “bespoke” magazine piece about yet another one of those studies showing conservatives are inspired by negatives while liberals are inspired by positives. The study’s goal was to prove a biological and cognitive difference between liberals and conservatives. I won’t bother to address how this leads us down a path to eugenics, but suffice to say that it’s always liberals these days who want to use “science” to prove that they’re superior. Danzico, of course, slightly misrepresents the findings. Another way of describing the findings can be found in the University of Nebraska’s own school paper: conservatives tend to be more realistic while liberals tend to be more idealistic. I find it amusing that a student journalist spins the study less than an adult professional journalist. And finally, there’s Adam Blenford’s piece worrying that too many people in the US aren’t registered to vote. Setting up the article by using a Republican as an example of a dedicated voter betrays the bias, if one understands that voter “disenfranchisement” is the primary motivation behind ACORN and Left-wing activists who encourage absentee ballots (Blenford uses the youth vote, another Left-wing target demographic, as his example there), same-day registration, and who attack laws requiring ID to vote, all methods behind voter fraud. Some people here may remember Newsnight hiring Left-wing activist and “investigative journalist” to do a special report telling you that only white Republicans engage in voter fraud, and specifically to disenfranchise black people. He also defended ACORN against charges of voter fraud by saying that, even though they do it, it doesn’t affect elections. If that’s not enough to convince you, just do an internet search with the term “voter disenfranchisement 2012” and see who’s worrying about it and what issues are the focus. It’s obvious. While not every single report is riddled with bias, much of it is, and nearly every single piece on the BBC’s US Election 2012 page is written from a Left-wing perspective one way or another. There’s no memo handed down to make this happen, no directive from on high. It’s due to the BBC hiring what seem to be exclusively Left-wing staff. If they all think that way, there’s no need for an organized institutional bias: it will happen naturally. It’s time for another one of these. This one clocks in at 16:45. Sorry, but it’s hard to trim this down to 15 minutes each time. Sources listed below. Note to defenders of the indefensible: This is meant as a rebuttal to BBC reporting on US issues. I don’t pretend I’m making some lofty, impartial report, but I am presenting facts and information about these issues you don’t get from the BBC. My opinions may be clear, but I’m also not playing games about it. Everyone can decide for themselves what to think about all of it, and call me out on stuff I get wrong. West Virginia Primary voting racist? McCain won West Virginia, 55.6% – 42.51%. The latest edition of my report is up on EyeTube now (no embed possible at the moment). It clocks in at 15:23. Some stuff the BBC covered badly, and some they haven’t covered at all. Sources are below, and my thanks to all those who took the time to listen to the previous editions. Here’s a new edition of my little coverage of US issues. My thanks to all those who listened to the first one, and for the kind words about it. I hope people find this one interesting as well. Apologies for this one being a litter longer, clocking in at a bit over 16 minutes. Just too many details to include. Links to everything I talk about are listed below, so everyone can decide for themselves. (UPDATE: See end of post) I didn’t even want to get into the Trayvon Martin George Zimmerman story, but the latest BBC report on the story, about a judge declining a request to raise his bail, is still misleading you on what happened. They’re still telling you that Zimmerman wasn’t charged immediately because of Florida’s Stand Your Ground Law. That was the initial story that was going around, but way too much information has come out since then so that it’s no longer the issue, and hasn’t been for some time. Yet the BBC is still stuck on that. The BBC has been publishing updates on Zimmerman’s situation, yet they’ve left out a huge amount of information, keeping you all not only uninformed, but left with a false impression of the story. The Stand Your Ground Law, at least in the Florida version, is mostly about defending against an imminent threat. It’s clear from the language that home invasion is a major concern. There is part of it that says a person has no duty to retreat when confronted with physical force, and is allowed to meet force with force, but the main thrust of it seems to be about defending against other situations like breakins and car-jacking, and not a physical altercation. In fact, the law was created in to clear the legal cloud prosecutors said disgusted them after having to charge a man in 2004 who shot and killed someone who had broken into his recreational vehicle. To further give you the desired impression, the BBC put together four case studies involving Stand Your Ground Law in Florida. Only one of the three involved a physical altercation, where a kid who was bullied brought a knife to school because he was afraid of getting attacked. The others were about a gang shooting, somebody shooting an unarmed man during an argument, and a guy who got into a drunken fight with someone and, after separating himself from the fight, one of them went and got a gun, came back and shot the other in a non-threatening situation. So now you’re supposed the think the law is awful. (2)Under those circumstances permitted pursuant to s. 776.013. Which is the next bit about home invasion, etc., which you can read on the same page I’ve linked to above. Why is it important to bring all this up? Zimmerman was engaged in a physical altercation with Martin. When that happens, it’s down to self defense. There was plenty of physical evidence of that fight, which the BBC has never reported. The only time they’ve acknowledged the notion is in a previous report about Zimmerman’s hearing, when they portrayed it as merely being his claim that there was a fight. But the evidence is real, not just a claim. The mainstream media tried to hide it to keep the racism Narrative going, but reality forced their hand. Since the BBC is unaccountable, they’ve simply kept that false story going without consequence. The evidence was out there, but the mainstream media tried to hide it. So no wonder the BBC News Online producers had no idea at first. But they should and probably do know now. So here’s what the BBC doesn’t want you to know. It’s all over the news that someone at NBC deliberately edited Zimmerman’s call to the police to make it appear as if he thought Martin was suspicious simply because he was black. Combine that impression with the half-a-story we were all fed at first that the young man was shot in cold blood, rather than during an actual fight, along with that photo the media circulated at first of a smiling, angelic much younger Martin (the photo in that HuffPo link), and many people got the idea that a young black kid was gunned down in the street for no reason other than the color of his skin. We know now that, while Zimmerman did say Martin was wearing a hoodie, there were other signals that made him suspicious. It took several days for the truth to even begin to come out, but by then it was too late. Most people had already formed their opinion by then, including, it seems the BBC. The BBC never told you any of this. NBC has since fired the editor responsible, but hasn’t made a real correction or national apology to their viewers. So many people still probably don’t know what actually happened, and have only that false story to go on. Early on, CNN had on a so-called voice expert to claim that Zimmerman used a racial slur in the call, further inflaming everyone’s racial anger. They’ve since had to quietly walk that back. Then we have the fact of the physical altercation after one of the confronted the other. Zimmeran says that after following Martin, he turned away only to be challenged by him. That’s his side of the story anyway, and we’ll never know Martin’s. But there’s also the physical evidence of that fight: the injury on the back of Zimmerman’s head, and the other evidence of a fight according to the police report. Unfortunately, when ABC initially showed police CCTV video of Zimmerman being brought into the police station, they deliberately fuzzed it up and obscured his head with a big lower third graphic so you can’t see anything. So when they claimed there was no evidence of a fight, everyone believed it, and again racial anger was exacerbated by a deliberate act of a major broadcaster. After being called on it, ABC released an “enhanced” version (i.e. after removing the doctoring they did) which, lo and behold, showed the gash on the back of Zimmerman’s head. Nothing about that from the BBC, either. The other really sad thing about all this – besides the tragic fact of a young man’s death – is that it seems extremely difficult to get the real facts of this story. Anyone doing a search for the various factors will notice that nearly every search result brings up a lot of partisan sources and precious little from the mainstream media. Try a search for various elements of this story and you’ll see what I mean. So no wonder everyone has a different idea of what happened, and no wonder we’ve now had retaliation violence. Yes, you heard that right. There have been at least one incident of black on white violence where the attacker said it was revenge for Trayvon Martin. Somebody also shot up a Sanford police car near the scene of Martin’s death. There was supposedly another one, but that one sounds to me like the white guy brought up Martin’s name first and really caused the problem. When you have people like Spike Lee tweeting what he thought was Zimmerman’s home address, Al Sharpton – who has his own primetime show on MSNBC – trying to incite race riots, and the President Himself expressing sorrow and emphasizing the racial angle, you get angry mobs baying for blood. So many people are convinced now that Martin was shot in cold blood for walking while black that if Zimmerman is actually tried and found innocent, it’s going to be a bad scene. All caused by the media. Since we now know that nearly all the initial Narrative on this story was false, and all that anger was based largely on false reporting and media bias, you’d think the BBC would do a special report on it, considering how important race and racism in the US is to them. After all, Jonny Dymond’s remit seems to be traipsing around the country looking for racists under the bed (see my latest “Life in These United States” for more about him) and the BBC did that World Have Your Say segment not long after the shooting about how white supremacy was a major problem. Plus, we’ve heard over and over again for the last four years how racist the US is, how racist the Tea Party movement is simply for opposing the governing policies of a black President. So now we have this awful racial divide going on over this issue, which was really caused not by the killing itself, but by mainstream media faking material and stoking the flames of racial hatred. The least the BBC could do, I think, is have another honest discussion about what’s actually happened. It’s hard to think of a valid journalistic reason why they haven’t addressed any of this. UPDATE: A totally different NBC journalist in Miami has now been fired for making his own false edit of the audio. As if by telepathic instruction, this completely independent act of editing took the same false approach. Now the station is going to add a line manager and extra layers of journalism to ensure this doesn’t happen again. Does that sound familiar? Keep hiring the same kind of people and give them the same sense of superiority and privilege, and they’ll keep doing the exact same thing no matter how many layers you add. I’m trying something a bit new and different here. After asking David Vance and the All Seeing Eye, I’m starting a real rebuttal to the BBC’s lame output about US issues. I can’t compete with the “bespoke” video magazine pieces, but I can provide a bit more information and analysis of real US issues that get spun by the BBC or simply censored out of existence. There’s much more to what’s going on over here than what affects the President or the latest racial issue or celebrity gossip, and there seems to be a vacuum which needs filling. So this is my humble attempt. It’s not possible to provide a proper rebuttal in fifteen minutes, but consider this an opening salvo. If enough people agree, I’d like to expand this from just me providing some info to a live audio or video discussion, where everyone here can call in or whatever, beginning next week. But more on that later. I’m also going to try and provide sources for everything I talk about, so everyone here can decide for themselves what’s going on. The BBC may not be held accountable for their actions, but the inhabitants of this blog deserve better. Hey, if you don’t want to listen to the audio, just check out these links instead. Audio hosted on EyeTube. My thanks to ASE. Wisconsin plus here, here, and here. On Monday, the President made a pre-emptive attack on the Supreme Court because He’s afraid they’re going to vote to overturn ObamaCare on the grounds that part or all of it violates the Constitution. Needless to say, there’s been a huge outcry, and a lot of fuss in the press about it. I commented about it here yesterday to give everyone a heads up before the BBC came in with their spin. The above is from the JournoList-infested and Media Matters (which is funded by Soros and coordinates with the White House) lapdog, Politico, which we know the Beeboids read. Sure, Politico is trying to spin it so that their readers don’t worry about it breaking the Treasury and hurting taxpayers, but that’s kind of beside the point. Another BBC daily read, the HuffingtonPost, spins that up front, and then admits ObamaCare will cover fewer people than promised. Unlike those who trust the BBC for news on US issues, readers of this blog will not be surprised that this will hurt small businesses and ordinary workers. BBC: We don’t want you to know about it. Instead, here’s some news about George Clooney and Rosie O’Donnell. News about some idiot getting convicted for making his gay roommate feel bad enough to kill himself is far more important, and worthy of remaining on the main US & Canada news page for days on end. Maybe they’ll get around to the issue when the Constitutionality of ObamaCare comes up before the Supreme Court in the next few weeks. The BBC continues its ‘Altered States’ series of reports to convince you that the US has somehow become more divided and racist since the election of a black President in 2008. It wouldn’t be called ‘Altered’ if it wasn’t somehow different from before, right? The last installment also featured race and pushed a “Racist US” Narrative. I won’t go so far as to say the reference to the movie was deliberate because of the ugly, base, primitive nature of the proto-human to which the star reverted, and the BBC is making a subtle accusation that whites who will vote for the eventual Republican candidate want to turn back the clock to the days of Jim Crow laws, lynching, and real oppression of minorities. I’m sure the BBC editor in charge just thought it was a cute turn of phrase. But you can all draw your own conclusions. The latest installment by digital media Beeboid Franz Strasser uses the racially divided city of St. Louis, Missouri to help paint that picture. The rich whites get the south side, while the devastated blacks suffer and are left to rot in the north. This selectively-portrayed microcosm is supposed to reinforce the notion that the US is racially divided, laying the groundwork for the idea that opposition to a black President is based on racism, rather than genuine, honest opposition to His policies. The city is clearly racially divided, and I don’t mean to denigrate the plight of African-Americans in this obviously failed city. I’m concerned here only about the biased reporting. Strasser has previous on dishonest reporting for the BBC. His first series of reports were about immigration in the US (middle of pg. 4 of the open thread). The dishonesty lay in the fact that the word “illegal” was censored from every single report, even while he was reporting from two ‘Sanctuary Cities’, which openly flout immigration law and harbor illegals. It was especially dishonest to omit the term because this report was conceived and produced when the illegal immigration issue was at the top of the news cycle. This latest report for the ‘Altered States’ series is no different. Spot the Missing Political Party. The Democratic Party has dominated St. Louis for more than 60 years. There hasn’t been a Republican mayor since 1949. All the policies which have contributed to the current sad state of affairs in the city have been enacted by Democrats. Yet Strasser fails to mention the political scene. If this had been a Republican-controlled city, you know the BBC would have made sure to point that out. The first black Alderman (the Board of Aldermen is the equivalent of the City Council in other cities) was elected in 1943. Today, no fewer than 13 of the 28 Aldermen are African-American, including the Board President. Now, does this sound like a city where whites oppress blacks and keep them down? It sounds more like Democrats and Democrat policies failing them than anything else. Yet the BBC doesn’t want you to know any of this, as it doesn’t help the “Divided, Racist US/Racist Republicans” Narrative they want to create in your minds in this re-election year. As it happens, the Tea Party movement, which the BBC often portrayed as racist, and US President editor Mark Mardell believes to be driven by crypto-racism, began in St. Louis, when a white woman started her own little protest against high taxes forced on the region by Democrats. This was weeks before Rick Santelli’s famous rant which gave the movement its name. Strasser missed an opportunity for race-baiting there because he, like all of his ill-informed colleagues at the BBC, simply didn’t know. Of course, everyone here knows of the BBC’s ignorance on the Tea Party movement. In any case, there’s something else Strasser left out of his sad tale of one city divided. While showing you street after street of empty, boarded-up houses and dead commercial blocks, he deliberately left out the fact that those buildings are empty because the African-American population has been leaving the area in search of better schools. They left to seek out a better life for themselves and for their children, because the Democrat-controlled city has failed them repeatedly for decades. Instead, you’re left with a racially-charged story without a single mention of the politics which led to the situation, with no information whatsoever given to help you understand it. As always, don’t trust the BBC on US issues. Especially, it seems, when it comes to one of their themed series of reports.